We sat down with Carl and asked some detailed questions to really help us understand his story...How he began his career, who are his influences, how does he go about writing, just to name a few. Hopefully, you'll know Carl a bit better once you read our interview. Enjoy! Carl, tell us how you got started in music. My dad strapped an accordion on me in the first grade and I didn’t like it because it was so big. I joined the choir in third grade and sang my first solo. I was a stand-out in the group because my voice was higher than everyone else - even the girls! How long have you been writing and recording? The timelines for writing and recording are different. I began writing songs on the piano beginning in my early teens. My first recording was made when I was a senior in high school. I wrote a song called “Elephant Land” that was featured in a high school musical, and it was recorded along with the entire production. When I entered the Armed Forces, I was in the Army Band and had access to all of the equipment and really began recording then. When you write songs, what is your inspiration? At first, it was about love and now it’s about lots of things. It’s people, places, or voices in my head when I wake up. Almost anything can be the inspiration for a song or a group of chords that become a song. My first influence was my father; he was an excellent pianist with a great ear. My aunt gave me an album by The Four Freshman and they influenced my singing, as did the Four Seasons – remember, I could sing REALLY high. As an adult, I have been influenced by Chick Corea, Michael McDonald of the Doobie Brothers, Rick Wakeman, James Taylor, Gino Vannelli, Blood, Sweat & Tears, Tower of Power, Chicago, Cannonball Adderley, Gerry Niewood and Grover Washington, Jr. It varies based on whether I’m playing keyboards, guitar or saxophone or being a vocalist. Different people influenced my different instruments. What's the first song you ever remember hearing? “Hold Me” by The Four Freshmen. I usually listen to Classic Rock stations on the radio or Smooth Jazz, but no specific artist. What's your favorite album by another artist? “Friends & Love” by Chuck Mangione. That’s a good question. It's a mix of Rock, Reggae, Light Jazz and Easy Listening. I’m a musical mutt. I hesitate labeling it, but have been told that it’s Adult Contemporary. Over the course of my career, I’ve played anywhere from churches to bars, and on major concert stages opening for artists such as Edgar Winter, Foghat, Marshall Tucker, ELO, Dave Mason and others. I’ve played many lounges in the major casino resorts in Las Vegas, including New York-New York, Caesars Palace, Golden Nugget, Paris, Sahara and the Aladdin (now Planet Hollywood). For over 10 years, I’ve been a featured performer at the Fremont Street Experience. What are your favorite and least favorite venues? Hands down, my favorite venue is the Fremont Street Experience. Least favorite would be any place that requires me to play only cover tunes. Outside of Fremont Street, do you perform anywhere else on a regular basis? Fortunately, no. <Laughs> I am happy to say that I’m booked on an annual basis to be part of the Fremont Street Experience. Songs from my latest CD "Promises," followed by songs from "All Blown Out." Do you ever play any covers? Not really, but I will when necessary for a private function. Do you have a set play list when you perform? I have multiple lists and play from several. I try to base it on the crowd vibe. It varies depending on what instrument I start with, either keyboard or guitar. I usually begin with a few chords, basically piddling around, and something will pop out. As the bits and pieces are all being put together, a melody will come. Sometimes I’ll hear a melody and then fill in the holes. What can you tell fans about your instruments? Are you subject to brand loyalty or will you play with whatever is available? What influences your choice of instruments? I’m not signed with any manufacturer, so I’m free to play whatever works for me. I currently play SAXOPHONE.COM horns. Because I perform outdoors in the heat and cold, I’m particular about those horns, however, I do play others for recording. It really is based on the sound. I chose SAXOPHONE.com because of the great sound for the reasonable price. Do you have a set time to practice each week or are rehearsals and writing more spontaneous? It’s very spontaneous. I write based on inspiration; no set schedule. However, I do spend time in my studio first thing in the morning almost every day. How do fans-to-be gain access to your music? Typically, fans who have purchased my CDs on Fremont Street share them with friends who can then order the music directly from my website or, even better, come and visit me in Las Vegas. Who has been an inspiration in your career? My fans, family and friends. What is your favorite track off of your new album, “Promises,” and why? “Flippin’ Beads” is a heartfelt song with a little rock edge. I really enjoy performing it. Making people happy and being able to share my art form. I can’t think of anything. I never feel like I have a “job” or have to go to work. I really love what I do. I play as much golf as possible, followed by more golf. I also love to travel with my wife and play golf. What would you be doing if you weren't a musician? What's the magic formula for your success? Being able to play original music in a unique setting. I really respond to the fans and that guides me in my writing and performing. What song of yours makes you most proud? I have never been focused on a label deal of any kind. At this point in my life, working on the road for most of the year would not be desirable. I would prefer to remain based in Las Vegas with my own show. How do you sell your CD’s/Audio Files? 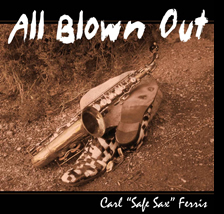 Currently, my music is available only through CD sales at live performances and both CD purchases and downloads via the Safe-Sax.com Internet site. Yes, a lot here in Las Vegas. I have done live television, radio and print. More writing, more music and many more years at the Fremont Street Experience.